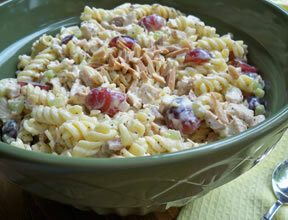 An easy-to-make chicken salad with a combination of layers that include pasta, eggs, and lettuce. The layers create a tasty salad that can be enjoyed as a light meal or served as a nice side dish. Cook pasta, rinse with cold water and drain well; toss with canola oil. Set aside. Place the lettuce on the bottom of the bowl; pour pasta over the lettuce. Add the hard-boiled egg slice on top of the pasta. Sprinkle with the salt and pepper; add a layer of chicken and then add a layer of peas on top of the chicken. Combine the dressing ingredients and stir until blended. Carefully spread the dressing over the top of the salad. Place in the refrigerator until chilled. Before serving, sprinkle with cheese and minced parsley. "Very good and will make again. 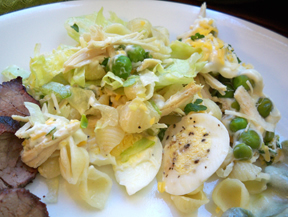 Instead of layering, I mixed the dressing, chicken, pasta, and peas together and served over lettuce, then sprinkled cheese and sliced eggs. I didn't add all the dressing at first, and each person added more to their salad based on personal preference. This would also work well with canned tuna I think." "I love recipes like this. It has everything you would want for a complete meal; meat, pasta, and vegetables. We enjoyed this as a light meal. 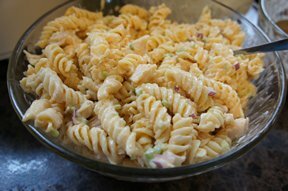 I did add a little more dressing mixture."